This lens covers the extremely popular 17-50mm focal length range (equivalent to 26-78mm in the full-frame 35mm format*) making it extremely versatile. It delivers impressive sharpness and striking contrast over its entire range of focal lengths and apertures. this lens delivers a fast f/2.8 aperture over its entire range of focal lengths for maximum creative flexibility. At its maximum aperture of f/2.8 it produces beautiful images enhanced by shallow depth of field and excellent bokeh (i.e. smooth, natural transitions in the out-of-focus areas of the image). 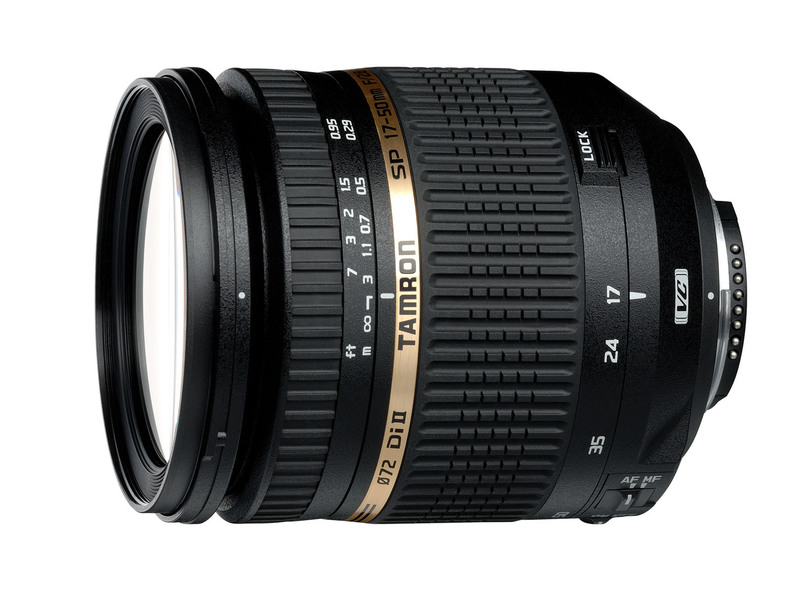 Equipped with Tamron’s state-of-the-art, tri-axial Vibration Compensation (VC) image stabilisation mechanism, which controls the effects of camera shake, this lens provides more opportunities for sharp handheld photography at the slow shutter speeds needed when shooting in low-light conditions (e.g. night or indoor scenes), dramatically enhancing the user’s level of photographic freedom. Three compound aspheric elements, special LD glass, and BBAR coatings ensure superb correction, colour fidelity, and freedom from flare. A minimum focus distance of 0.29m (11.4 inches) offers exciting close-up opportunities. * Using a conversion value of 1.55x. The time and intrusiveness of setting up a tripod to stabilise the camera and increases the spontaneity and flexibility of shooting. Moving to a higher ISO setting, where noise or ‘digital grain’ reduces image quality. Using flash to ‘freeze’ blur from camera shake, which not only results in a less natural-looking image but can also be intrusive during shooting. Equipping a fast lens with VC technology extends the range of handheld shutter speeds, and all the consequent advantages, even further. Even when shooting in light levels where handheld photography is generally possible, combining the fast f/2.8 maximum aperture of this lens with the VC image stabilisation permits dramatic blur from subject movements – previously requiring the set-up of a tripod. The addition of an image stabiliser tends to increase the size of a lens. As this lens is a large-diameter f/2.8 zoom, the optical image stabilisation system is also relatively large compared with other VC models. However, through improvements to optical, mechanical and VC designs, the filter thread is a compact 72mm. The latest BBAR (Broad-Band Anti-Reflection) multi-layer coatings reduce reflection from the lens, ensuring excellent performance in all photographic conditions. These coatings enhance light transmission in both short and long wavelengths. Internal coatings have also been applied to all the cemented surfaces of lens elements, providing sharpness, optimum colour reproduction and excellent colour balance. *Values are for the Nikon-mount model.